Gorgeous, firm colas flecked with gold and reddish brown, with very visible THC crystals. A Fabulous Furry Freak Brother favorite. Sativa Cup Winner 2010. 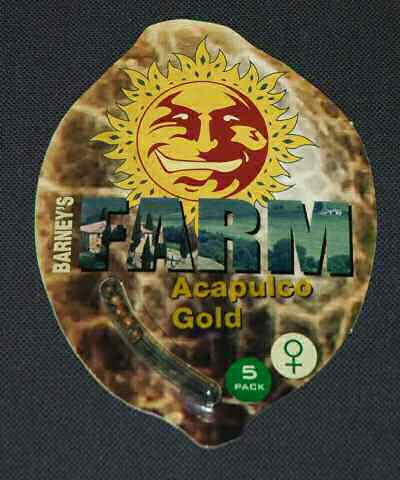 Thanks to recent advances in marijuana genetics we?ve pioneered, the quality of our Acapulco Gold goes beyond the often rhapsodized smoke of days past. Just as importantly for us, however, was capturing its spirit. Like the original namesake, these gorgeous, firm colas are flecked with gold and reddish brown, with very visible THC crystals. The intense fruit cocktail of flavors pack a strong sensation that really lingers. Acapulco Gold is sativa dominant, offering a long lasting high that balances upbeat effects with body-relaxing, stress reducing calmness. * You can pay with these currencies: Australian Dollar, British Pound Sterling, Canadian Dollar, Euro, Japanese Yen, South Africa Rand, and US Dollar.